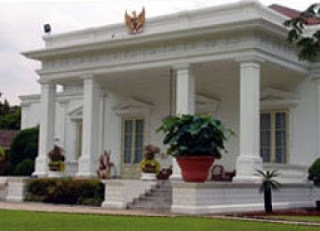 In addition to the Hotel Indonesia round about (Bundaran HI), the Presidential Palace is a favorite location for the protesters, who would like to express their aspirations to the government. Why the State Palace, because in this place, the President of the Republic of Indonesia office. National Palace is one of two main buildings are located on Jalan Medan Merdeka Selatan, Jakarta. The building overlooks the river Ciliwung or Jalan Veteran. Building next to it there is the Presidential Palace (facing the National Monument), Bina Graha, and Government House. Initially, Jakarta Palace complex contains only one building, namely the State Palace. The palace was built in 1796 on the orders of the Governor General Pieter Gerardus van Overstraten and finished 1804 in the reign of Governor-General Johannes Siberg. In the beginning , building area of ​​3375 square meters of Ancient Greekstyle architecture of this two-story. But in 1848 the top demolished, and the front downstairs made ​​larger to give the impression of more formal. Building form is a result of changes in 1848 survived until now. The palace building was originally a cottage owned by Dutch businessman, JA van Braam. At that time the area later known as the Harmony is the most prestigious locations in Batavia. In 1820 Van Braam cottage was leased and then purchased in 1821 by the colonial government, to be used as a center of government activity, as well as the residence of the governor-general when dealing in Batavia (Jakarta). The governor-general then most do choose to live in a cooler Bogor Palace. But sometimes they have to come down to Batavia, in particular toattend Council meetings, every Wednesday. Van Braam's house was chosen because the Palace Square Banteng Daendels unfinished. Once completed the building was only used forgovernment offices.